The present invention provides methods for detecting urushiol-bearing plants such as poison ivy, poison oak, and poison sumac. Accordingly, one aspect of the invention is a method of detecting a urushiol-bearing plant, the method comprising: dispensing a urushiol marking composition on a surface of the urushiol-bearing plant; then detecting a visual change on the urushiol-bearing plant caused by the reaction of the urushiol marking composition with the urushiol borne by the urushiol-bearing plant. This solves the problem of misidentification of these urushiol-bearing plants and allows for eradication measures to be implemented. From a basic homeowner wanting to protect his family, to commercial garden services wanting to eliminate this growing threat from their properties, to the Forest Service and other government based organizations wanting to make public grounds safer... this formula will help to identify and isolate these toxic species of plants. 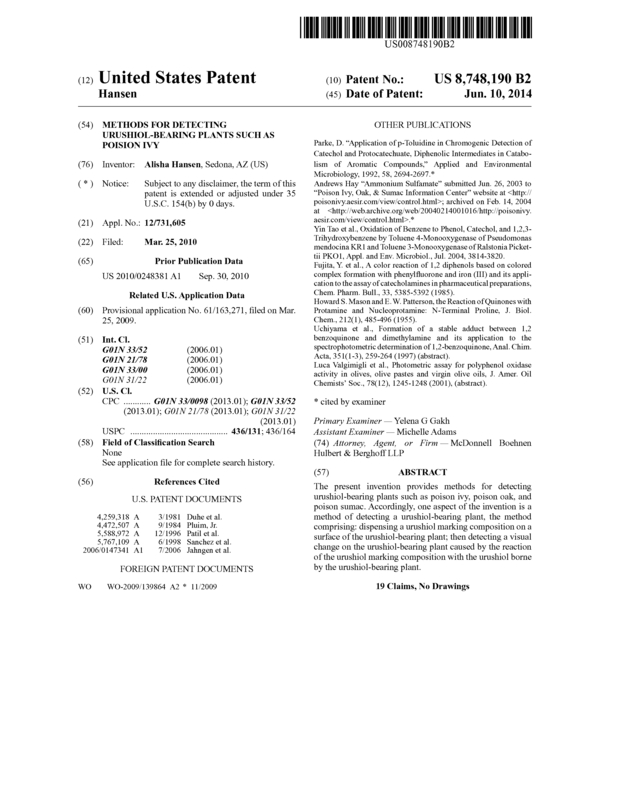 Page created at 2019-04-25 14:01:51, Patent Auction Time.